We don’t want to discount how delicious a box of macaroni and cheese can be. Sometimes that childhood favorite hits the spot. But other times you crave a cheesy pasta that caters more to the adult palate. Fancy mac’n’cheese has been a staple at world-class restaurants around the globe for years, and it’s surprisingly easy to make an upscale version of this American classic in your own kitchen. There are a few rules you can follow to instantly amplify your mac’n’cheese. Upgrade your noodles from classic macaroni to cavatappi. The bigger noodles provide a good, simple base for you to get creative with cheese and toppings. Mix up your cheese. Cheddar is great, but blue cheese, feta, and parmesan instantly fancy-fy your dish. Top the bowl of mac’n’cheese with lightly toasted bread crumbs. This textured topping adds an extra layer of sophistication, literally. Experiment with meats. Bacon is an obvious choice, but its thinner and lighter-tasting cousin, prosciutto, can give your mac’n’cheese the extra kick it needs to graduate to an adult-worthy pasta. Try these three easy recipes to elevate your mac’n’cheese from a childhood favorite to a five-star dish. Cook the pasta, drain well, and set aside. In a medium saucepan, melt butter, whisk in flour, and cook. Stir constantly for one minute. While whisking vigorously, slowly pour in milk and whisk until well combined. Bring sauce to a gentle boil, stirring constantly. Then, reduce heat to low and simmer for two minutes, stirring frequently, until thickened. Add 2/3 of the feta cheese and all of the provolone to the sauce and cook over low heat. Stir constantly until provolone has melted fully (feta will not melt fully). Season sauce with salt and pepper to taste. Add pasta to sauce and toss to coat. Add 3/4 of the diced bacon and toss. 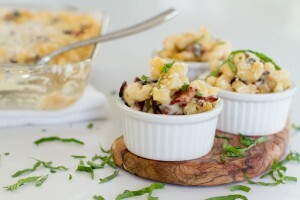 Pour mixture into a baking dish and top with remaining bacon and feta cheese. Move the oven rack three racks below the broiler and set oven to broil on high. Cook until feta cheese is golden brown, usually one to three minutes. Serve warm, and enjoy! Preheat oven to 400 degrees. Place a large pot of water over high heat and cover. Roll up pancetta and slice into strips. In a large pan over medium heat, cut the pancetta strips until they just start to crisp (three to four minutes). Drizzle one tablespoon balsamic vinegar over pancetta and stir. Allow pancetta to dry on paper towel and set aside. Melt butter in a medium saucepan over medium heat, then whisk in flour. Continue to cook, whisking sauce, for about 30 seconds. Add rosemary, and continue for another 30 seconds. Slowly add warmed milk and half and half and bring sauce to a simmer, stirring constantly. Meanwhile, liberally salt pot of boiling water. Add pasta and cook for one minute less than package directions. When sauce has thickened, reduce heat to low and stir in gouda and fontina until melted and sauce is smooth. Remove from heat and stir in remaining tablespoon balsamic vinegar. Season with salt and pepper to taste. Drain cooked pasta and stir into cheese sauce until well combined. Pour pasta mixture into a baking dish and sprinkle with half of smoked gouda. Top with cooked pancetta and then remaining smoked gouda. Bake for 15 to 20 minutes, or until topping is crisp and cheese is bubbly. If pancetta starts to get too dark, cover with a piece of aluminum foil. Serve and enjoy! Preheat oven to 350 degrees. In medium pot over medium heat, melt butter. Add flour and whisk for three minutes until lightly browned. Add heavy whipping cream, half and half, garlic, cayenne, Worcestershire sauce, and salt and pepper to taste. Stir for about three minutes over medium heat until sauce is slightly thick. Remove from heat and add sun-dried tomatoes and cheeses, reserving 1/2 cup white cheddar, 1/2 cup monterey jack, and 1/2 cup blue cheese for topping. Stir until cheese is melted into sauce. Butter a baking dish. In a large pot, add sauce to pasta and stir until pasta is evenly coated. Pour into the baking dish and spread evenly. Sprinkle reserved cheese over the top. Sprinkle with paprika if desired. Bake for 25 to 30 minutes until cheese bubbles, and let sit for five to 10 minutes before serving. Enjoy!